Wendy Pua | Malaysia Chinese Lifestyle Blogger: Comian : Mac promotion set with super valuable price. 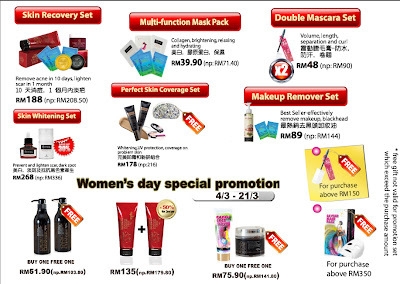 Comian : Mac promotion set with super valuable price. Some with Buy 1 Free 1 As Well!!! Braphy Vibranting Mascara only RM48 for 2!! Even their Best Seller Gold Cacao Mask also in this Sales : 2 for RM135! April Fools' Day Party Here I Come! Food Review : Sen Tsuru Japanese Buffet. PJ Laugh Fest 2011 is back! 感应 VS 自杀感应 FROM TT2TT.